The one-lane iron bridge on Bull Pen Road spans the Chattoooga River above a powerful 10-15 foot cascade (read: Class V or VI rapid). 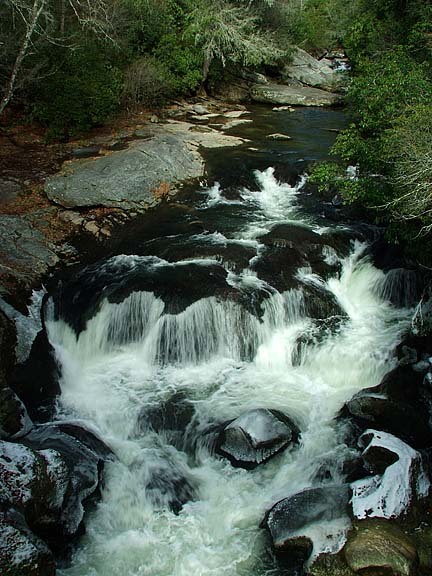 However, waterwater rafting, canoeing and kayaking is prohibited on this section of the Chattooga. The falls can be easily viewed at the bridge, or you can take a short trail just past the west side of the bridge to the top of the cascade. 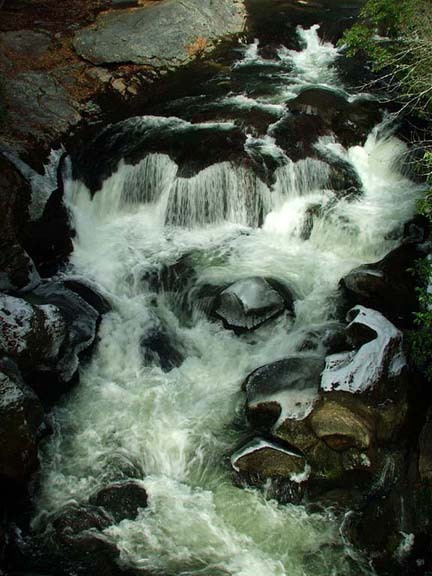 At the bottom of the cascade, the powerful Chattooga has carved deep swirlholes in the rock (pictured below). Over thousands of years, small pebbles and grains of sand were swirled around by the water to create these holes. 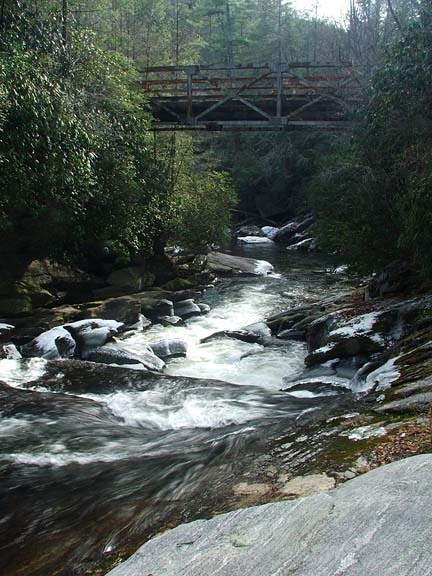 Several hiking trails are in the area, including a new loop trail that follows the river upstream. 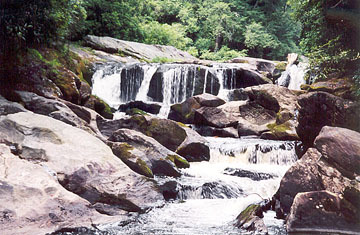 Plus, this is a popular spot for fly fishing. Directions: From Highlands, head east on Main Street (SR 1603). This road will turn into Horse Cove Road. Follow for 5 miles to where it forks. Whiteside Cove Road bears left. Take the right fork (Bull Pen Road) for 3 miles to the iron bridge. From Cashiers, follow Hwy. 107 south for 6 miles and turn right onto Bull Pen Road. Look for the tractor trailers and warehouse on the left to verify you're turning on the correct road. If you cross into South Carolina, you've gone too far. Follow Bull Pen Road west for 5 miles to the iron bridge. Park on the west side of the bridge or at the top of the hill.